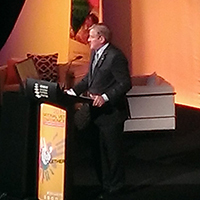 The Hon Ian Macfarlane MP, Minister for Industry, was a Keynote presenter at the 2014 National VET Conference in Brisbane last week. The Australian Government is overhauling the skills and training system, with a package of reforms that elevate trades and vocational education to the centre of Australia’s economy and put the focus squarely on ensuring Australian workers are highly skilled and job-ready. The Government’s reforms will create a new streamlined and effective system. The Minister has made several significant announcements in his opening address around ASQA changes, moving towards a more ‘earned autonomy’ and a new approach to the development of training packages. The Government will put in place reforms that will get rid of the excessive red tape for high-performing training providers and let them get on with what it is that they do best – delivering the highest calibre training that meets industry and the economy’s needs. ASQA will more broadly delegate the power for training providers to make decisions about changing the scope of their registration. What this means in practice is that the training providers who have consistently demonstrated the highest of standards and regulatory compliance will no longer have to seek ASQA’s permission to make changes to their registration. Providers that have consistently demonstrated a high level of regulatory compliance will shortly be contacted and invited to apply for the delegation. ASQA is now automatically updating training providers’ scope of registration to include any new, equivalent version of a training product they are already registered to deliver. Providers don’t have to apply to do this, it is automatic and there is no fee. At the end of the current contract period with the 12 Industry Skills Councils, the Minister has announced that he will move to a more contestable model for the development and maintenance of training packages. The current ISCs are welcome to tender under this new model along with new groups. The Government will release a discussion paper shortly, looking at the processes they currently have and exploring new ways for the future. The Minister has confirmed that the Government are on track to introduce new standards for training providers from January. Under the new standards, providers will be required not only to engage with industry, but to demonstrate how industry has informed their training and assessment. For more information please click here or contact the VET Reform Taskforce.